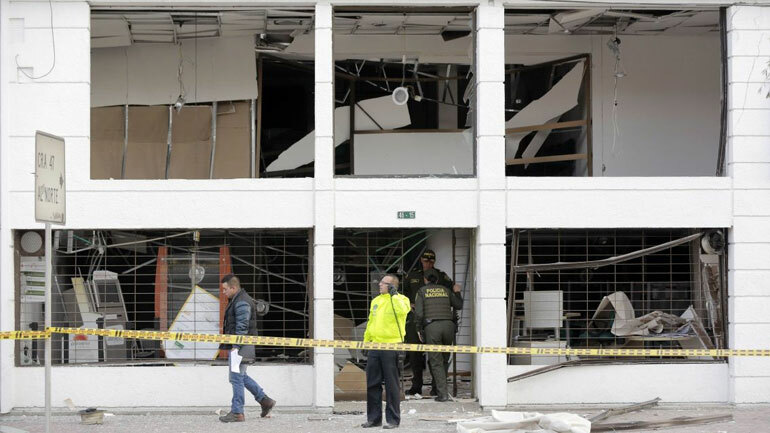 Colombia’s police arrested 17 people for their supposed connection to two bombings in Bogota last week at two pension fund offices. However, among those said to be ELN rebels are legitimate rights defenders and students. The arrests have been condemned by NGO Congreso de los Pueblos (People’s Congress) as “legal false positives,” arrests made in order to show that the people “responsible” for the attacks were arrested or “positive results,” but are not based in truth. In fact, a judge already ordered the immediate release of two because of a lack of evidence. These arrests were specifically targeting people active in the social movements in Colombia such as students, women and human rights defenders, and professors. This is a clear attempt to break the strength and organization of the social movements and instill fear in the hearts of those who dare to speak their mind and participate in political activities. The arrested have been accused of terrorism and rebellion for their connections to the bombings as well as bombings that happened last year during the commemoration of the 50 year anniversary of the ELN guerrilla group. Last week was the 51st anniversary of ELN and thus the bombings have been attributed to the them. Today, the 17 people were arrested in their houses were accused of being part of the urban cell of the ELN and had their houses raided by the national police. According to the authorities, they found materials that supposedly linked them to the ELN such as political pamphlets, posters, papers, and documents; things that any activist or politically minded person might have lying around. Their guilt may be based on their having a “Che” poster in their room, or being specialists in studying and writing about the armed conflict in their country. With this evidence, they arrested three workers in the city administration, one professor, and various university students. Below are some of the people arrested whose innocence has all but been assumed by the mainstream media and government officials who have been quick to assume they all are connected to the ELN and are guilty, violating their duty to believe innocent until proven guilty. Knowing these individuals, it is impossible to believe this discourse and it becomes obvious that these arrests are part of an ongoing war against social and political activists and the social movement in general. Lorena graduated with a degree in political science last year from the National University. She is the daughter of two teachers and is the oldest of 3 siblings. She is recognized for being a leader in the student organization MANE (National Student Roundtable) that fights against university privatization and for free higher education, and for her active political participation in the Colombian political party Alternative Democratic Pole. She is also a employee of the Department of Education in Bogota. Paola studied law at the National University of Colombia and is a well recognized lawyer on a national level for her work with women’s reproductive health. She is most known for a case when the Constitutional Court approved the right to an abortion for a 12-year-old girl in 2012. She works in the Department of Health for the City of Bogotá. Paola was a student activist and is now part of The Women’s Convergence for Political Action (La confluencia de mujeres para la acción politica). Sergio graduated from the District University with a degree in Social Communication. He is journalist and editor in the Press Agency Colombia Informa where he has specialized in the themes of conflict and peace. He is an employee of the Department of Education of Bogotá. Daniel is a student a the National Teaching University where he studies philosophy. Victor is a student at the National University of Colombia where he studies geography. Andres is a student at the National University of Colombia where he studied philosophy and is now doing a masters in political studies. Jhon and Liseth, siblings, are students at the National Teaching University. Heiler is a student at the National Teaching University where he is a the student representative to the Superior Council at the university. The nine described above are all part of the People’s Congress, which is social movement comprised of various sectors of Colombian society such as students, workers, women, peasants, indigenous communities etc. The NGO has been active in challenging the current government’s policies on mining and energy and its approach to peace and has consistently demanded that the government give guarantees to the social movements for their political and social activities. It is also important to note that these arrests under false evidence and pretenses come at a moment when the national government is in the midst of a peace process with the FARC (Revolutionary Armed Forces of Colombia) that’s not going too well. On the other hand there has also been a concerted effort by the ELN and the government to establish a peace process. Many read the latest attack accusations as a veiled effort to thwart these potential peace talks.